This week we’ve been thinking a lot about the Chicago Teachers Union strike. Today, instead of putting up a picture of a striking schoolteacher, I thought I would illustrate this post with another kind of picture that also is about who we are and want to be. This photo was taken this month in Griffin Court in the Modern Wing of the Chicago Art Institute on the final day of the Roy Lichtenstein retrospective. 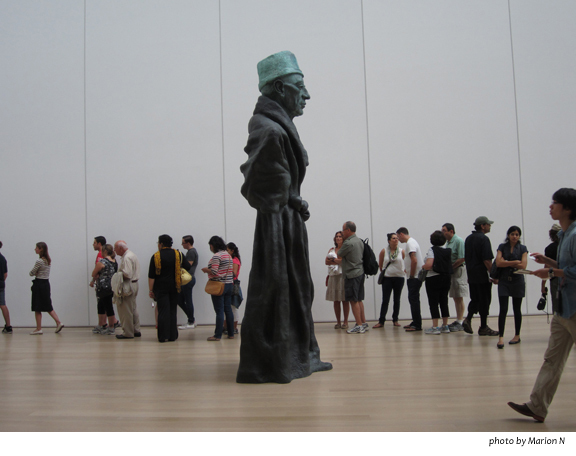 In the foreground is Thomas Schütte’s Vater Staate. These people you see standing along the wall were in line to see the Lichtenstein show. Vater Staate, like many of Schütte’s earlier works, is rooted in the harsh reality of life under a totalitarian regime. Elegantly robed and more than 12 feet tall, Father State dominates even this massive space, looking ahead with a calm, bland gaze: enormous, powerful, and utterly indifferent to the many below. Here is the thing about this photo. The line for the show, by noon, reached from the show’s entry point at the south end of the museum, through a long hallway, down a flight of stairs, through a doorway, across McClintock Court, through the doors into the Modern Wing, and well into Griffin Court, the central feature of the Modern Wing, almost to the Millennium Park entrance – a line pretty close to a city block in length. Hundreds, many hundreds, who had come in hopes of seeing and learning about one of the great artists of the 20th century, whose work plays with the touchstones of our everyday experience. Their willingness, their patience speaking to their curiosity, but also to an openness to great achievement, and a delight in its example. This is the greatness of democracy and the highest form of it: that excellence is within the reach of all, and that all can aspire to it. These days, I often fear we have collectively forgotten how hard it was to make this world, in which the baseline is the desire to learn and know, to achieve and appreciate achievement. Which brings me back to the Chicago teachers, who have collectively decided that sound, decent learning, given free to all, is a good thing, essential to our democracy, and not something to be dismantled in favor of a profit center. Finally, one more thing to note about Vater Staate, which is not clear from this photo: a bit of hope. Vater Staate dominates the room. But his hands are caught up inside his robe. His arms are bound by it. His own trappings, knotted tight, are the architecture of his defeat. A thing to keep in mind, in the days to come. This entry was posted in Uncategorized and tagged Art Institute of Chicago, Chicago Teachers Union, CTU strike, public education, Roy Lichtenstein retrospective, Thomas Schütte, Vater Staate. Bookmark the permalink.